An anticipated drop in humidity could hinder the efforts of firefighters battling a 6,800-acre blaze Saturday in Northern California, according to a fire official. Fire officials also expect a north-northeast wind and higher temperatures, all of which would make conditions drier, said Julie Hutchinson, spokeswoman for the California Department of Forestry and Fire Protection. 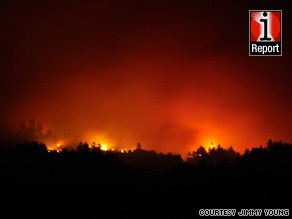 The fire, covering 10 square miles in Santa Cruz County, lies alongside the Santa Cruz Mountains, about 60 miles south of San Francisco. The “outlook is still a little stressful,” she said, while noting the fire did not spread much overnight. “Our biggest concern is … [that] we don’t have that 100 percent containment.” As of 8 a.m. (noon ET), the Lockheed Fire was 30 percent contained, Cal Fire reported. No injuries have been reported. “We’re going to be here for a while,” Hutchinson added. Watch how the weather is affecting containment efforts » Nearly 300 residences are threatened in the Swanton and Bonny Doon communities, the department said. Two outbuildings have been damaged, but it was not immediately clear where they were located, Hutchinson said. Up to 2,400 residents have fled the Swanton and Bonny Doon areas, the department said. A mandatory evacuation order was issued Thursday. Bonny Doon residents Sophia and Fred Johnson are living in their RV, according to CNN affiliate KTVU. The couple returned home Friday morning to lock up and collect their valuables, KTVU reported. “We just went back this morning it’s clear blue sky up there but the wind is starting to blow up that way,” Sophia Johnson told KTVU. “I’m not feeling super optimistic actually.” The fire prompted officials to declare a state of emergency for Santa Cruz County. Gov. Arnold Schwarzenegger visited the area and was briefed on the fire Saturday, according to a statement released by his office. “My administration is doing all we can to ensure the state has the emergency response resources in place to respond quickly to the Lockheed Fire and to fires that continue to burn throughout the state,” the governor said, according to the statement. “California has the best and bravest firefighters working on the front lines to protect our citizens and I am confident that they will beat back these fires like they have done in years past.” The cause of the blaze, which began Wednesday night, was under investigation, said Cal Fire spokeswoman Megan McFadden.